Even as Prime Minister Narendra Modi arrived in Gandhinagar on Friday, the Gujarat capital, for “celebrating” his birthday, which falls on September 17, top Gujarat Dalit rights leader Jignesh Mevani, who spearheaded protests following the gruesome Una flogging incident of July 11, was "picked up" by the Gujarat police. Mevani's cousin, Viral Mevani, is said to have seen Jignesh being picked up as he came out of the Ahmedabad airport. In a social media appearance, which has gone rival, he says, he “saw” Jignesh being taken away by the police, but with clue where. According to sources, Mevani was taken to the Ahmedabad Crime Branch office at the Gaekwad Haveli. The cops told Mevani's supporters that he would set free "after taking his statement". Jignesh Mevani returned from Delhi after attending the Dalit Swabhiman Sangharsh rally, which was addressed, among others, by Prakash Ambedkar, grandson of Dr BR Ambedkar, founder of the Indian constitution, and several Left leaders, including CPI(M) general secretary Sitaram Yechury. At the rally, Mevani gave a call to Dalits to organize rail roko and mass chain pulling programme across the country, starting from the former constituency of Modi as Gujarat chief minister, Maninagar in Ahmedabad. The programme has been proposed for October 1, a day before the Gandhi Jayanti day. Meanwhile, Mevani has declared, there would be a series of other mass meetings across Gujarat ahead of the “big” rail roko plan, including mass meetings and moholla sabhas. The Gujarat police has acted against Mevani despite the fact that there was a distinct view that the rail roko and chain pulling programme across India had failed to find support among Dalit rights activists, who openly began saying they would "not be part of it." Modi would be celebrating his 66th birthday on Saturday by distributing assistive aids and appliances in Navsari in South Gujarat to 11,000 differently-abled persons – considered by circles around him as the hibhest number in the world ever at one spot, which would become a Guinness Book records. Other Guinness records being planned on the occasion include 1,000 oil lamps lit by differently-abled at one time, a formation by 1,000 wheelchair-bound persons and distribution of hearing aid to 1,000 beneficiaries. Well-known CPI-ML leader Kavita Krishnan was the first to sound a note a protest against Mevani being picked up. She said, “What is the BJP Government of Gujarat scared of? Arresting and jailing leaders of movements only displays your fear of those movements. Arresting the leader of the Una Gujarat Dalit movement proves it has scared the Gujarat government and the BJP nationally. Congress leader Shaktisinh Gohil tweeted: "Dalits detained, Patidars under house arrest, Gaurakshaks beat up and kill a youth. Welcome Prime Minister Modi toGujarat on his birthday." Modi's arrival in Gujarat for celebrating his birthday coincided with the death of a youth, Mohammad Ayub, in an Ahmedabad hospital after he was attacked by cow vigilantes. Modi recently called 80 per cent of cow vigilantes as fake and anti-social, asking state governments to prepare their complete list and act against them. 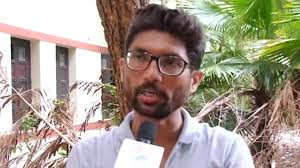 Meanwhile, Dalit rights activists have asked those who have already come across the news of Mevani's detention to call up Gujarat DGP PC Thakur on his mobile number 9978406255, Ahmedabad commissioner Shivanand Jha (9978406258 ) and Ahmedabad range DIG Dr KLN Rao (9978405089) to register their protest.